Inspired by the grace and beauty of leaves, this leafy swirls design is simply gorgeous. 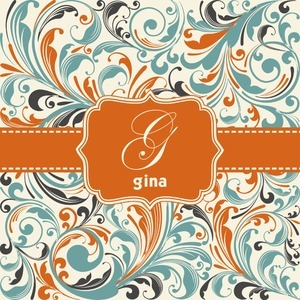 The beautiful orange and blue colors of this design were actually inspired by my favorite floral design. The orange and blue along with a splash of gray on a tan background create a gorgeous set of colors. The leafy swirls coordinate spectaculary with our orange and blue striped pattern and the three design together are part of our orange and blue swirls & stripes collection.